I am looking for a Pooh Bear blankie which I brought for my daughter about 3 years ago from Marks and Spencer (made by Disney). 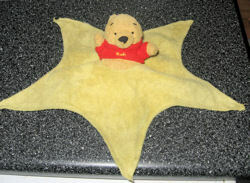 It is a Pooh bear body with no legs which is stitched on to a yellow 5 sided star blanket, approx 11 inches across. It has been a long time and I do not know if you are still looking. On Ebay in UK but will ship worldwide. Ebay # 120749687266. Best of luck.